I am indebted to Ben Douwsma for filling out my video collection and Chris Otto for On Call: The St. Elsewhere Appreciation Club newsletter. One of the best things about blogging is interacting with people who share your interests. That's especially valuable when there isn't much out there about your interest, like in the case of St. Elsewhere. That was one of the reasons I started this blog--to share what I had learned. From what I could tell, there weren't any other active sites devoted to compiling phenomena about the show. So I am especially grateful to have been graced by the generosity of new St. Elsewhere friends. Last year, I wrote a post about the three episodes in my collection where the soundtrack failed. A fan named Ben Douwsma read the post, contacted me and offered to send me a DVD containing his copies of the episodes I was missing. I reciprocated by filling the holes in his collection. Thank you very much, Ben, for helping complete my episodes. The other wonderful thing that happened recently comes courtesy of Chris Otto, whose blog Papergreat was featured in an early post on this blog. He had written a post in celebration of St. Elsewhere's 29th birthday in October of 2011, and that's where I first learned of The St. Elsewhere Appreciation Club and its newsletter, On Call. It was produced for seven issues in the late 1990s by James L. Longworth, Jr., and featured several pieces that involved interviews with cast and crew. Chris had copies of the seven issues, and upon connecting with the St. 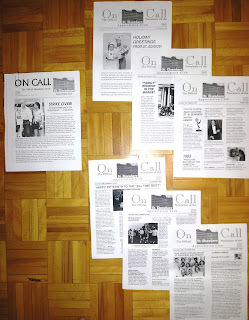 Elsewhere Experience, he graciously offered to send me photocopies of the newsletters. I am pleased to announce that these copies arrived in the mail recently. I will be transcribing these newsletters one article at a time, and I will be adding a page that compiles links to all the articles in each issue. These are truly a treasure trove of St. Elsewhere trivia and stories, and I'm pleased to have the opportunity to share them with the world. And thanks to Chris, we'll all get to enjoy the great stories, trivia and behind-the-scenes information that James L. Longworth assembled in On Call. To honor their contributions, I have given them a permanent tribute in the right sidebar, in a new section called Friends of the St. Elsewhere Experience. Also, I'd like to thank everyone who has been leaving comments lately. It's always great to hear from other fans. Your voices make the site better!